I love when dogs are used in creative advertising. Since so many of us take our dogs for a ride in the car (and they love it), how appropriate that Ford Motor Company has used dogs in its latest ad? Love your dog? Restrain it when riding in the car! 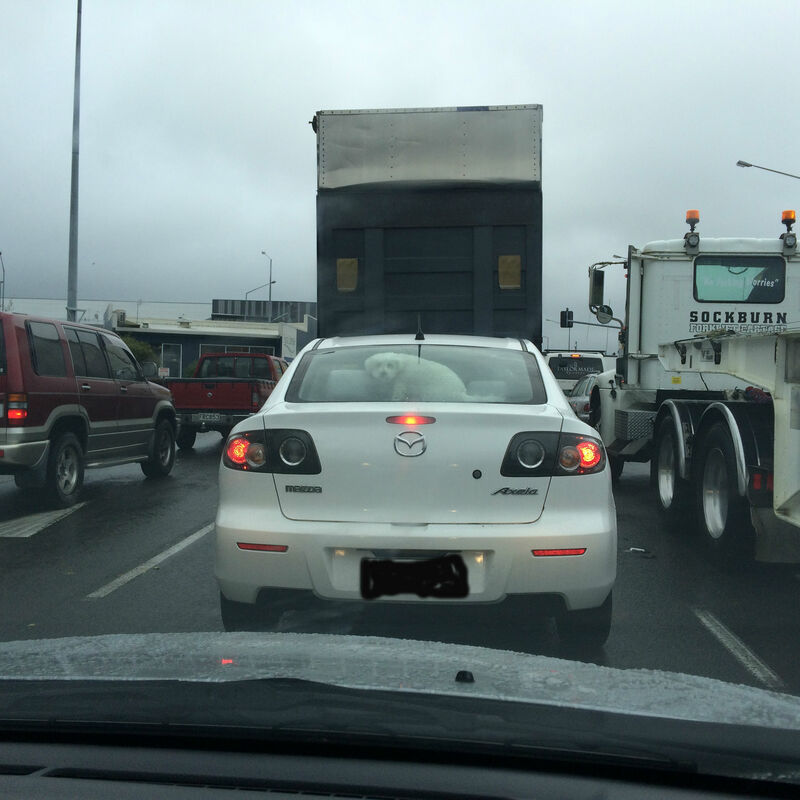 You can clearly see this little white dog sitting on the ledge at the rear window of the car. I watched while the dog moved around on the ledge and onto the back seat of the car, then back again. If this vehicle had to stop suddenly for any reason, this dog would go flying! Just as the driving safely videos show things like drink bottles flying after a crash, so too would this little dog. If it survived, it would likely need intensive medical care that would be both painful and expensive. I don’t see enough dogs in Christchurch that are restrained properly using a car harness. It’s very concerning. I’ve even met and talked with vets about this subject, and many have admitted that although they know they should restrain their own dogs, they don’t! Most vets don’t even ask as part of the annual check-up with their clients whether or not their dog travels in a vehicle and, if so, whether it is properly restrained. We need more people leading from example…. …like the lovely lady who came yesterday to fit her Labrador puppy, Harley, with an auto harness. She’s training him at a young age to accept being restrained in the car. Please let me know if your vet encourages you to restrain your dog when traveling in the car. I’d like to promote them via my Facebook page. And send me photos of your dog safely restrained in the car! Researchers at the University of Alabama at Birmingham say that senior drivers who always take their dog in the car are at an increased risk of being involved in an accident. Overall and at-fault crash rates for drivers 70 years of age or older were higher for those whose pet habitually rode with them. The crash risk for drivers who always drove with their pets was double that of drivers who never drove with a pet, while crash rates for those who sometimes or rarely drove with pets were consistent with the rates for non-pet owners. The study involved 2,000 community-dwelling (those who do not live in assisted living or nursing homes) licensed drivers age 70 and older, of whom 691 had pets. 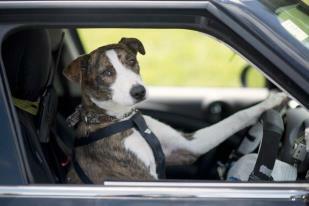 Study subjects took a survey on driving habits, and those with pets were asked about the frequency of driving with pets. Participants also underwent visual sensory and higher-order visual processing testing. 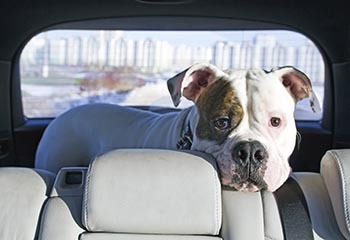 More than half the pet owners said they took their pet with them in the car at least occasionally, usually riding on the front passenger seat or in the back seat. I’d really like to see a study comparing accident rates with properly restrained pets and those without. I support the use of safety harnesses for dogs who are traveling in cars and am consistently amazed at the number of people who allow their dog in the car without restraint. The research team has published its research in the journal Accident Analysis and Prevention.